Before continuing setting up your payments make sure to download Pay Simple's app "AppConnect". This is not to be confused with Pay Simple's standalone app "Pay Simple". You will need the AppConnect app to use the integration. 1st. You'll need to click into the settings tab. 2nd. 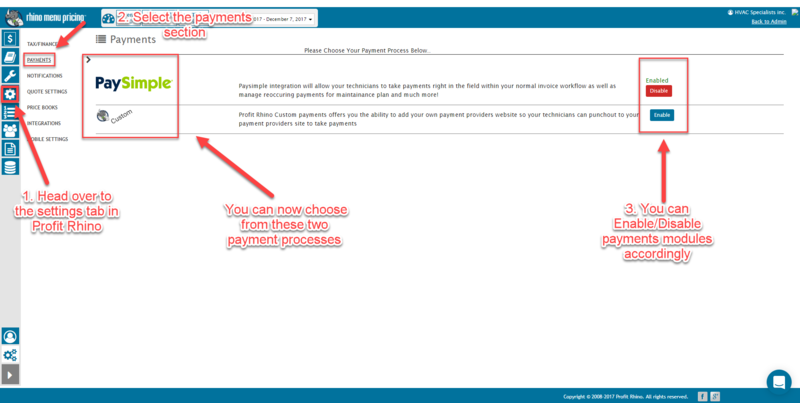 Make sure you head into the new payments section. 3rd. Enable your payment modules accordingly. 1st. You'll first need to name your payment option to help you differentiate it from other payment options you may choose to set up. 2nd. Input the website URL of your particular payment portal of choice. 3rd. Add a phone number for your payment institution so your technicians or customers can call with questions. 4th. Input a 4 digit code to make this payment option unique. It can be any combination of letters and numbers. 5th. Select whether or not this will be used for credit cards for ACH payments. 6th. Make sure this payment option is enabled. 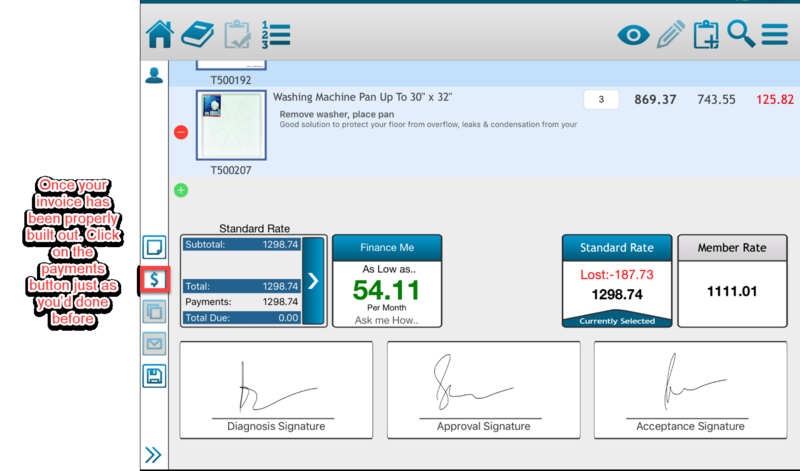 This integration allows your technicians to take payments right in the field within your normal invoice workflow as well as manage reoccuring payments for maintainance plan and much more! 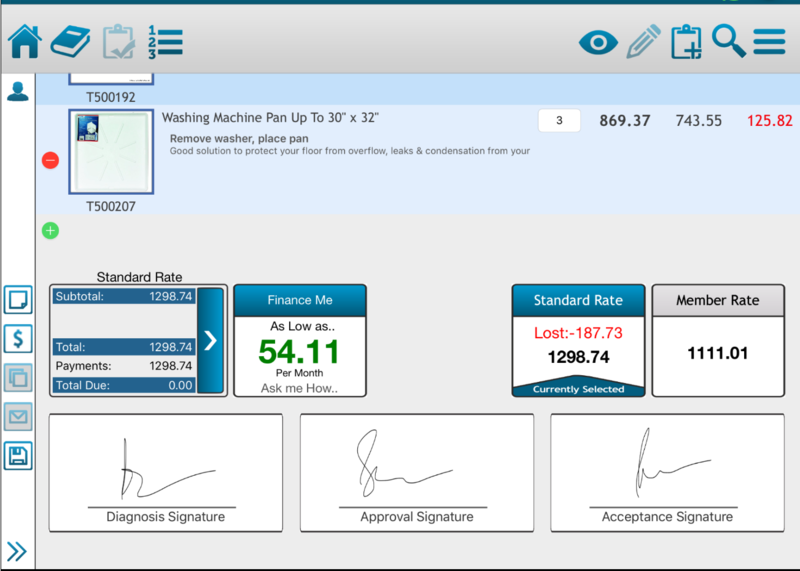 Once you've completed all the steps that have been outlined above, you'll be ready to use your new payment option in the Profit Rhino mobile application. Just make sure you've got the latest version of Profit Rhino installed, and your book is synced up. 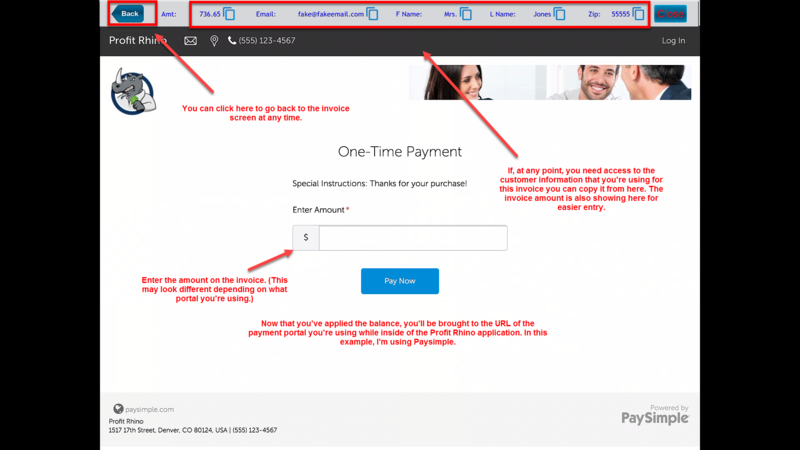 Your payment option should appear as follows in the web. 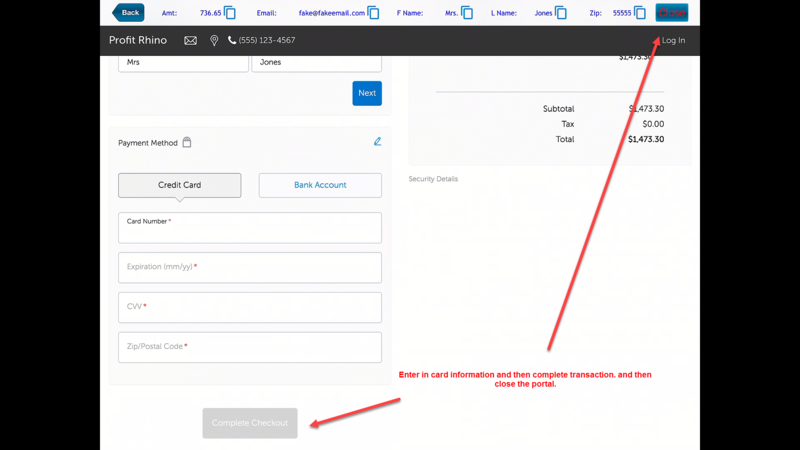 A couple things to note here, all the customer information you've entered for this invoice will appear in a bar at the top of the screen regardless of what payment portal you're using. If you need to use this information at any point, you can simply copy and paste it where it's needed. As I said above, your payment portal may function a little differently. 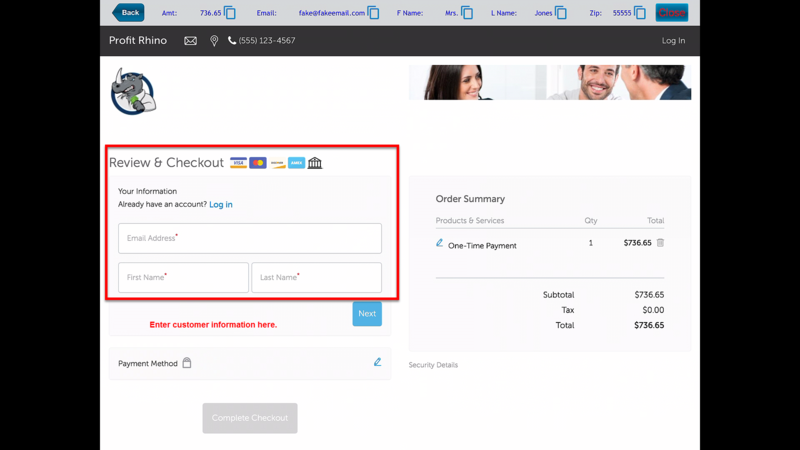 But for Paysimple, once I've entered in the customer information and credit card, I can complete the checkout and then click the close button to return to the invoice screen of the Profit Rhino application. Now you can see that my payment has been applied and I can move on with any other steps I might take with this customer and invoice. 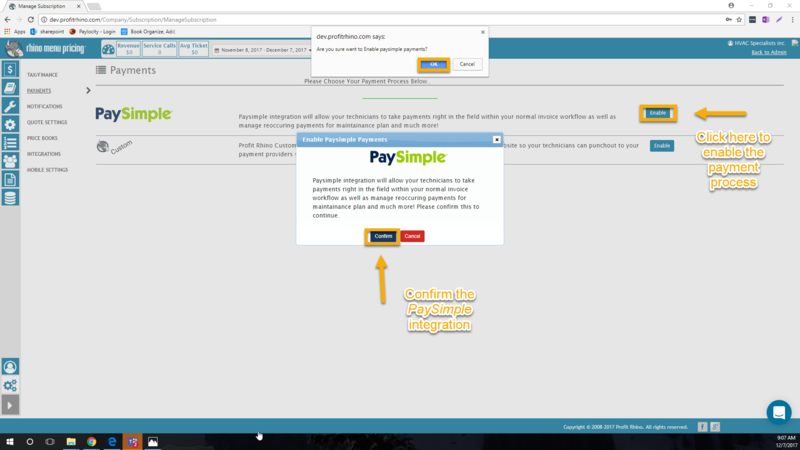 Now certainly, this is not the peak level of integration Profit Rhino will have with payment processing applications. But, what we have here is the beginning of an amazingly streamlined Profit Rhino process. Good luck.